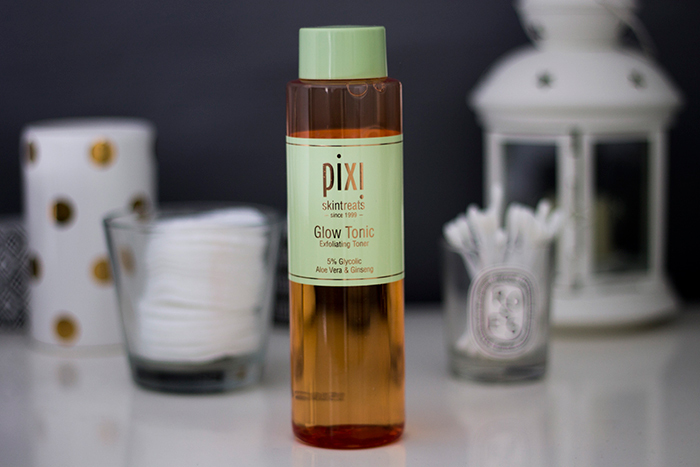 After many disappointing hyped up product buy's over the years, there's a lot of products I refused to spend my money on and the Pixi Glow Tonic is one of them. Until recently. Normally with cult beauty products, the hype lasts for a few months then you never hear from it again but the Glow Tonic is still going strong. When my favourite liquid exfoliator was finished, I decided to give in and see what all the fuss is about. I'm a big fan of exfoliating toners and I can really see a difference on my skin since using them, but not every brand works for me. Alpha H Liquid Gold did nothing for me but La Roche-Posay's Effaclar Micro-Exfoliant was wonderful so I wanted to find something like the latter.. but more effective. The Pixi Glow Tonic basically helps to exfoliate the skin gently, removing dead skin cells to reveal fresh, healthy skin underneath. It exfoliates with chemicals rather than those physical beads that can cause more damage than good. For me, I wanted it to get rid of the rough dry patches on my skin so my foundation could sit better and also if it managed to reduce some acne scarring in the process..I'd be happy with that too! I'm glad to say the hype is real and this product really does work. I go through phases with my skin where it's behaving itself to full blown breakouts and since using this stuff.. my skin has never looked better, for a much longer period of time. I'd easily say my skin hasn't looked this good in 10 years and I definitely think the Pixi Glow Tonic has a part to play in that. As for my acne scarring, it's still there but these things take time but I have noticed a small difference in the darkness of some areas so it's definitely helping. If you think your skin is looking a little dull, in need of a boost then I'd definitely recommend picking this up. Give into the hype!